When word came down a few weeks ago that East Side Access was again over budget and late, I guessed the delay would be minimal, pushing the project’s completion date back into 2020. Today, Ted Mann blew the cover off that theory as he reports in The Wall Street Journal that East Side Access may not be completed until 2021 and could cost as much as $10 billion. It is the latest setback for a deeply flawed project beset with problems. Officials from the Metropolitan Transportation Authority will present a new timeline for the project, known as East Side Access, to members of the MTA board on Monday, and now believe trains might not run into the station until 2021 or beyond. Others within the authority said the project cost might not reach $10 billion, and noted that the higher estimates build in the risks of future delays. The timeline for completion also could be shortened, one official said. The MTA’s most recent cost estimate was $8.2 billion. The new completion estimate has its roots in November 2012, when officials at the MTA’s Capital Construction division rejected the bids for a major contract to build the “Manhattan Structures”—construction in the station caverns and related facilities and systems. The bids had come in some $365 million over the MTA’s budget for that phase of work. Rather than accept the bids, MTA officials said, the authority rejected them and broke the Manhattan Structures contract into smaller segments, some of which are still being advertised for bids. The MTA has reserved all comments on East Side Access until after Monday’s board committee meetings, but this thing is a mess. While officials have repeatedly called it the “most technically complex” of all MTA mega-projects, this is a self-inflicted wound. The station cavern is unnecessarily deep, and the engineering challenges have added to the project’s woes. It’s not yet clear exactly why this project will be eight years and billions of dollars over budget, but heads should roll and causes discovered. With the latest news, the questions will sure to focus around its future. Should the MTA continue? Can the money go elsewhere? At this point, too many federal dollars have been sunk into this project and too much of it exists to stop now. It was flawed from the start and continues to be a never-ending morass seven stories beneath Grand Central. Nonsence! This project no matter how flawed is vital to the region as a whole & that fact MUST NOT be overlooked. Beyond that, the project isn’t flawed at all. In fact, it is the most important transit project in the region, and many other crucial projects depend on it. The execution may be flawed, but the underlying premise of the project is not. Cancelling it might just be the single stupidist transit idea imaginable. No, the project is flawed because the execution is flawed. You can’t have a project without execution. If you admit that the execution is flawed (and it is), then you admit that the project is also flawed. No matter how beneficial to the region as a whole the underlying principles are, no matter how much it makes “sense” from an emotional-thinking, gut-feeling perspective to see this thing through, logically speaking, we’ve crossed the line. It is, at this point, no longer worth continuing. In fact, given the kind of aftershocks and ripple effects borne out against the entire remainder of the mass transit universe by the continual failure of East Side Access: how much harder it makes our jobs as advocates for investment elsewhere, the inability to allocate funding to other projects in the short term and the reduction of available funding for other projects in the long term because of all the money lost to budget overruns and schedule slips… canceling the project will hurt us, but it’s going to hurt less than completing it would at this point. We’ve crossed that event horizon. I mean, if you believe that canceling the project will “hurt less” than completing it, then surely there is evidence for that. You have given none. The money that has already been spent can’t be spent again. Not completing the project would be a huge waste especially when the ongoing benefits will last decades. But where is this spigot of money that covers the endless overruns (and how do I get in on it)? They just “found” another $6 billion? Look towards homelands security & defence contracs. Yeah. It’s more valuable for security than, y’know, most of what the Air Force does. Why not fund it from the DoD budget? That will have to be found – the Feds, Bonds, Taxes, fares, MTA starts doing the lottery and wins the ‘mega millions’ etc etc – but that does not mean that the $$ needed to finish ESA would be available for other projects. What should have been the most expensive part of East Side Access — the tunnel — was completed in the early 1970s. That isn’t even included in the cost over the past nearly 20 years. It’s looking like a total of 25 years, including the pre-start bureaucracy. It’s a crime. That’s always the excuse on Long Island. The service stinks compared with Metro North because the LIRR Network is “complex,” with all those trains merging and diverging at Jamaica. Really? How “complex” is it compared with the B division of New York City Transit? How complex is it compared with Union Pacific’s big complex out in Nebraska? The public should go on strike instead. Use one lane of the Long Island Expressway for commuter buses. Have them exit to Queens Plaza where riders would shift to the subway. Keep the LIRR shut down until East Side Access opens. The most expensive part of modern subway construction these days (and I’m going to use the term “subway” very liberally to define a underground rail structure with stations) is not the tunnels, but the stations. Tunneling for ARC (which, had it continued, would probably be in the same boat as East Side Access) was only $2B of the project’s cost. The Jamaica operation is only complex because they insist on timing every Atlantic train with a Penn train, and cross-platform transfers for everyone. It works fairly well until something screws up and they attempt to maintain this pattern; in service outages, the LIRR will just stop running service (isntead of diverting to Hunterspoint or Atlantic NYCT-style). Then the lesson is no more stations. If ARC is ever revived, it should be three tunnels — and no new underground platforms. A third rail tunnel to the existing Penn, to permit more flexible operations. And the two-track Flushing Line extension, to a single track loop terminal adjacent to Secaucus. A single loop track isn’t enough to handle capasity, a duel track operation is required. Why “third”? There’s only one tunnel to Penn from the west. Or do you mean it should be single-track? Because that’s a really bad idea. It saves money, but not a lot, since the tunnel isn’t the expensive part. And the station tracks and the access tunnel from the west are arranged in such a way that it would be very hard to coherently run a peak 2-and-1 arrangement like on the Outer Borough els with express service or even Metro-North (which is 3-and-1 on Park Avenue). The station would have to be operationally two separate stations, one that is 1-and-0 and one that is 1-and-1, and the 1-and-0 station would then have to have lots of train parking. West Side Yard can probably handle that, but this means ARC-North rather than ARC-South. At this point, too many federal dollars have been sunk into this project and too much of it exists to stop now. This is the textbook definition of “throwing good money after bad,” as a point of fact. I’m not going to suggest we try to the use the money for anything else because the money isn’t going to be there when we cancel the project – but make no mistake, we’ve already sunk too much money into this thing to continue. …instead of connecting the LIRR to Grand Central. At this point, we probably stand to gain more in the long term from cancelling the project and going back to the drawing board with the intention of running LIRR trains into Grand Central and not under it. At this point, we probably stand to gain more in the long term from cancelling the project and going back to the drawing board with the intention of running LIRR trains into Grand Central and not under it. It’s too late for that, better to complete the project & let the dollars fall where they may. Perhaps a more interesting idea would be… move all Penn Station bound LIRR service to the new station. It may not be perfect, but at Penn the LIRR is just a tennent there. Escalation of commitment was first described by Barry M. Staw in his 1976 paper, “Knee deep in the big muddy: A study of escalating commitment to a chosen course of action”. More recently the term “sunk cost fallacy” has been used to describe the phenomenon where people justify increased investment in a decision, based on the cumulative prior investment, despite new evidence suggesting that the cost, starting today, of continuing the decision outweighs the expected benefit. Such investment may include money, time, or even — in the case of military strategy — human lives. The phenomenon and the sentiment underlying it are reflected in such proverbial images as “Throwing good money after bad”, “In for a dime, in for a dollar”, or “In for a penny, in for a pound”. Additionally, “irrational escalation” (sometimes referred to as “irrational escalation of commitment” or “commitment bias”) is a term frequently used in psychology and sociology to refer to a situation in which people can make irrational decisions based upon rational decisions in the past or to justify actions already taken. Is it a vital project to the region in terms of mobility? Sure it is. Do you believe this is going to be the last time the schedule slides and the budget runs out on this project? Because I sure don’t. Better to quit now with only the loss of the money and time we’ve spent on this so far than to quit in 2015 with an extra year’s worth of lost money and lost time behind us. In the context of ESA as it stands right now, in this moment, with what we’ve learned about the project and how far we’ve come… the costs of continuing outweigh the benefits by far. We should cut our losses. the costs of continuing outweigh the benefits by far. I don’t dispute anything you’re saying, but this is where I’m not sure I agree with you. Unless they really don’t have a realistic path forward and so they keep extending out the delivery date in 1-2 year increments whenever they get asked how this is looking. I thought they had definitively finished blasting for the GCT cavern. I’m really curious to know what element or elements are responsible for the perma-delay. Based on the level of fustration being posted here, it semes that you might as well put the entire regional transit system in mothballs & just forget about it. But of course that’s unrealistic since the transit system drives our econemy. Probably HVAC/systems and connecting the GCT bathtub to the mezzanine; I haven’t seen any completed escalator shafts, have you? Sunk cost fallacy can go either way. The efficacious way to look at whether we should continue to build is to determine the net present value of completing the project from where we stand now. What we spent already is completely besides the point. Today, we are further from completion than we were when we started and the running tally of dollars-over-original-budget has long exceeded the initial $4.3 billion price tag. It is not worth continuing. Extrapolating future schedule slips along the established track record suggests an actual completion date of “never,” no ifs, no buts, no maybes about it. The farther we allow inertia to carry us along on this never-ending voyage of the damned, the more lost expenditure we leave behind us. It’s not too late, it’s never too late to say ‘this isn’t working and we need to stop what we’re doing and figure out why.’ That’s a nice little hedge bet if outright cancellation is too unpalatable at this time – at least stop all work and don’t restart it until we know why the cost and the schedule are on a solid course towards “$Infinite” and “Never” respectively. How much is the cost to complete it? Based on the trend of schedule slips that very literally suggests this project will take forever (as with this latest schedule backslide, the average time added to the schedule with each backslide now exceeds the average amount of time between schedule slips and therefore we are losing ground faster then we are gaining it), the cost to complete the project is $Infinite/Undefined/NaN/Your-choice-of-noun-here. I can’t tell you what the actual cost projects to because of the fact that the end date can’t be accurately projected to either, and for that reason, the project should at least be indefinitely suspended until we find out why the estimated-time-to-completion is rising faster than the rate at which time passes. My guess is either that we’re the victims of a very drawn out sandbagging process (as Eric F. suggests) or that several key players in this thing are running one hell of a kickback scheme, cleverly disguised as sandbagging. Both are certainly criminal, so take your pick: do you want the root cause to be criminal incompetence or criminal malevolence? I honestly don’t know the answer to my own question above, but before a stop becomes remotely financially justifiable, it needs to be answered, taking account the possibility for future overrruns. I actually can buy a return to the drawing board. It would probably have to be short though. The thing about these kinds of projects is stopping them is also expensive. Set-up costs aren’t exactly cheap, and we probably lose (and may have to pay back) any federal financing received. Whatever is left to complete would have to be very expensive to justify that, even accepting criminal incompetence and criminal malevolence. And that’s before even considering politics. OTOH, I’m not so sure about anything criminal. I think it’s quite possible they’re just following the onerous, ridiculous rules they’re supposed to follow. So let me get this straight. They dumped the first contract for the station because it came in over what they thought they were going to get, then split it into a bunch of smaller projects to attempt to reduce the costs, and some of the small contracts still haven’t been bid out? This is just gross incompetence. $365 million over budget for one, solid contract would’ve been a bargain compared to the mess that’s happening now. What was that contract to cover though? And how much of the delay is attributable to problems with that one element? $365 million over budget? What was the budget? What ended up happening was that, when all the bids for the big “Manhattan structures” contract came in, they were all priced higher than what the MTA wanted to pay. They then broke up the contract into smaller bits in an attempt to make it cheaper. As of right now, that strategy has backfired, and some of the smaller contracts haven’t even been signed yet. I’m getting this all from the WSJ article. I didn’t really like the article. Mentions how far over the MTAs budget the bids were, but didn’t mention the MTAs budget, or what’s behind the discrepancy – why did the MTA think it could be done so much cheaper. This was for Manhattan structures II yes? The first Manhattan structures bid was years ago and to excavate the caverns I had thought. What’s this one for? I was hoping for more of an answer than this. No mention of how the cost compares so far, even for the bids that have been answered. We can assume that the difference is probably greater than it would’ve been with the single project due to the fact that the cost of the project is expected to increase by $1.6B. The MTA thought it could be done cheaper because saying it could be done cheaply is what got the project approved. When the goal is to get projects approved (assuring the jobs program continues for all involved), reality-based cost estimates come after the press conference announcing the project. $2 billion over budget for one solid contract would be a bargain compared to the mess thats happening now. A lot of it goes back to the walking-on-eggshells situation the MTA finds itself in, when it comes to building major projects underground with the smallest street-level footprint as possible. Nobody wants to go back, or would risk the liability costs, of going back to the cut-and-cover work of the original IRT and BMT lines from 100 years ago, where if the occasional house or street car ended up in the excavation because the sidewall of the tunnel or the wooden overhead planks have collapsed. But since the Sixth Avenue extension and the aborted SAS sections in the late 1960s and early 70s, the new underground projects have been designed to only be apparent at the surface in the areas of the station shells, and in the case of ESA, to leave virtually no street level footprint at all (and the 60s and 70s cut-and-cover safety procedures were far more advanced than what had been used a half-century earlier. It vanished after that mainly because too many people wanted new lines only if they never had to experience any street-level disruptions and were taking the MTA to court to never have their lives upset for one second). The desire to construct an extreme deep cavern, bi-level terminal in the middle of Manhattan for ESA, while doing as much as possible to prevent anyone at street level from knowing anything at all is being done is going to be costly. 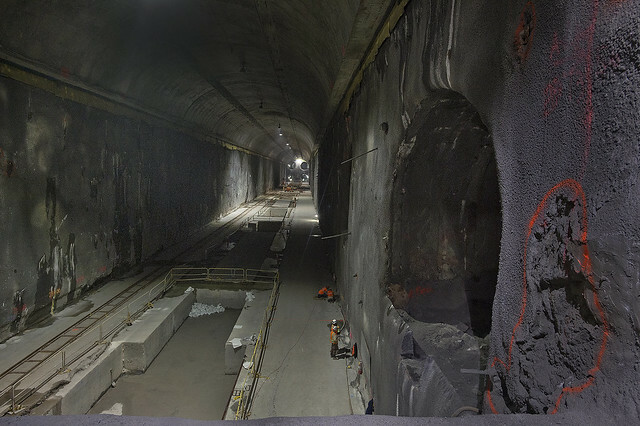 My hope is, if they ever do get Phase II of the SAS started, the at least temporary return of cut-and-cover to connect up the 1970s-era tunnels might convince the MTA that not everything has to be deep cavern construction going into the future. I thought tunnels from the 70s were going to be used as tail tracks in phase 1. The south section of the uptown area done in the 70s, 99th to 105th streets, is to be linked with the new deeper tunnel work. The 110th to 119th Street section isn’t, so the MTA will have to do a quarter-mile cut-and-cover to join the two sections. Why isn’t the 110th-119th street section to be linked with the deeper tunnel work? A return to cut-and-cover is appropriate in New York. Tunneling machines should be saved for when you have to dive under other tunnels. The problem with this idea is that well, all the projects currently have to weave around tunnels or connect to existing deep ones (like 63rd). The major cost of the projects we have now are the stations, and those on the Second Avenue Subway are also cut and cover (which is why Phase II is projected to cost as much as Phase I besides no bored tunneling; the section north of 116th is projected to be cut-and-cover and mined. It should have been a much smaller-scale station. ESA and ARC should have been ESA-ARC, and NJT and LIRR should have made an arrangement to serve each other’s territories. It’s only cheaper and improves regional connectivity. Ugh, that wouldn’t be too useful. There’s already infrastructure for through-service from NJT to the LIRR. It’s the existing Grand Central that needs the connection to Penn. Why is *that* useful? If all the railroads service both terminals, I figure NJ and LI just need access to the east side. If that’s provided, the worst-case scenario for anyone trying to get to the side of town they want is a single transfer at Secaucus or Jamaica/Woodside. So they have at least 8 years and 6 billion left on this thing? So they are arguable further away from completion now than they thought were when they originally started the project. If this were military procurement, I think the view point would be write it off to experience and junk it. 2021, to me, is perilously close to “never”. To say that work will take another 8 years to me implies that they have engineering or logistical challenges that they don’t exactly know how to address and so they just keep pushing out the delivery date. Next time, spend the money on real estate. Demolish a block in the CBD whatever the insane cost would be and build a station near the surface. At least that seems technically feasible. Thank you. This is my point exactly. I disagree with the assessment that we need to demolish a block of the CBD because I remain convinced that the logistics challenges of running LIRR into Tracks 100-117 alongside or in place of MNRR trains are surmountable if we are upfront about them and make the focus of the re-designed ESA about overcoming those challenges instead of building new station infrastructure. But other than that caveat – I agree with you completely. Yes. Was I wrong to think that the original plan was to use GCT, which had available capacity, rather than build another terminal there? The “original plan” has never been to use GCT platforms. The iteration from 1968 would’ve seen a whole different terminal building in Midtown East. The current iteration used a GCT lower level option as an alternate, but it was deemed too disruptive. Is connecting the new ESA tunnel to the existing GCT tracks/platforms at all possible? If so, it would make a huge amount of sense to abandon the deep cavern while simultaneously tackling Cuomo’s Metro North to Penn plan. This would be a win/win/win. Billions saved/ESA achieved/MNRR to Penn achieved. Oh, and I would imagine it could all be done well before 2021. Then again, the current ESA project was supposed to be done already. But it’s worth at least looking at. Oh you’re referring to MNR access to Penn. Still head bang-worthy, but yes there are a number of selfish pols from Long Island completely opposed to MNR Penn access. But if Cuomo is behind the plan, that could make the difference. It would free up capacity at GCT for the LIRR and diverted trains from Penn would free up capacity there for MNR. I agree with this. They have no idea when this will be done and are just making things up at this point. I have absolutely no confidence in the 2021 date. I jokingly tweeted to Ben, “This is why we can’t have nice things.” But it’s sadly all too true. Seriously, there are any number of large-scale transit projects that the city and region desperately need, but they all end up being incredibly late and incredibly over budget. This doesn’t happen everywhere, so why is it so consistent here? The only upside to this boondoggle is that it makes SAS Phase 1 look like a well-run, economical project. It’s so consistent here because our workers here are not held accountable for working efficiently. They get paid the same regardless of how quickly they make progress and their unions are powerful enough that no one can fire them for working too slowly. So the system encourages delays and cost overruns. What I don’t know is why the MTA doesn’t just use a contract structure where contractors are paid a lump sum in installments as milestones are reached rather than based on time and materials. Then you put the onus on contractors to keep things on schedule since they pay for any delays. As a creature of the state, the MTA is required to follow state rules on bids, and I’m not sure if that is permitted. It’s not just the “workers”. It’s the executives running the companies which bid on the contracts. The NYS bidding system is designed to encourage scamming by the construction companies, and to allow them to get away with it. This project makes the “Big Dig” look like a successful project. The reality is this project will not be cancelled, because they have invested too much money. The biggest problem is that other stuff that the MTA and (or) the politicians want like a that have not already been started such as a Phase III or IV of SAS or a New Penn Station are simply not happening. There is no way that the Federal Government can afford to foot the bill for such projects, particularly when the MTA and similar agencies have shown their inability to get costs under control. The sad thing is unless Bill DeBlasio can set an example to Cuomo and the others on how to control costs, the attitude will never change. I hope for New York’s sake that by being a “Progressive” he can do exactly that. Somehow I don’t think the theme of the DeBlasio admnistration is going to be ‘cost control’. The idea that progressives are those who think ordinary people should be a fair deal from business and government is 100 years out of date. Today’s progressives believe it is fair for government to serve as alternative way to big business for some additional people to get a better deal at the expense of ordinary people. You haven’t met any progressives, apparently. It means the same thing it did in 1890. Whether DeBlasio actually is one? Doubtful. If I’m not mistaken, the lower level at GCT is no longer in use (or is it?). Was any consideration ever given to the idea of letting the LIRR use the lower level, or part of it, while Metro_North used the upper? They did consider it. Infighting between the two railroads led them to stop considering it. Some here might remember the MTA board considered merging the two railroads, but it didn’t pass. To this day for the life of me, I cant figgure out why other than the thieftem mentality that exists. Well, for starters, the two railroads run on completely different rule books, so you don’t exactly gain efficiencies of scale with the merger of two workforces. You’d also have to somehow figure out how seniority would work, along with pensions and other workforce drudgery. This problem isn’t just limited to the MTA; after all, mergers in the airline industry only really finished after a good decade of trying. And yet mergers in the airline industry happen all the friggin’ time, despite massive antitrust hurdles and fleet incompatibilities and 50 different state attorneys general out to make sure their local port authority doesn’t get cut out. The LIRR absolutely has a long and storied history, and in the modern day it has its own rulebook and its own unions and its own institutional culture, but it’s not like all of these things were discovered on stone tablets on the beach when the first Lenape tribe arrived on Long Island: if the legislature actually cared to do it, they could make the merger happen. Worst unions I’ve seen in the US and the worst institutional culture I’ve seen in a passenger railroad. Well worth destroying. Mergers successfully happen in railroads too. What you do is, you merge them, you adopt the Metro-North rulebook, you use standard “district based” seniority procedures. Pensions aren’t an issue thanks to Railroad Retirement. If the LIRR workers go on strike over that, you replace them with workers who are willing to deal with the changes. The trouble is that the LIRR *management* was also engaged in turf war — not just the workers. Airline mergers are easier because in this day and age, the manufacturers have tried to make as many of them as certification-compatible as possible. Both railroads are getting new PTC signaling from the same vendor, for what it’s worth. The signalling systems are not significantly different, and more importantly, most of the differences in the rule book have nothing to do with the signalling system. You are thinking of the yard that MNR gave up below GCT for the LIRR station. The lower level includes the 100 series tracks & the new station has the 200 series tracks. The latest delays are due to issues with the most recent contract coming back with bids that were well above what the MTA was willing to go with. So the MTA broke that contract into smaller parts, and they haven’t got back all the bids. That’s part of why they’ve added to the delays, but why it ever devolved to this point is a question that has yet to be answered. They wont cancel the project since they’re too far into it to give up. There isn’t the money to devote to other projects either, including the 2d Ave line (Phase 2). But it does once again highlight the problems with keeping these mega projects on time and on budget. It kind of makes sense at an abstract level, but when you realize that East Side Access is probably too difficult for smaller contractors, it becomes clear that biting the bullet with the bigger, slightly more expensive contract would’ve been a better idea. This just bodes extremely poorly for an further phases of SAS or any other project further down the pipeline. ESA is completely sucking funds and will for transit improvements elsewhere. Other countries and cities can get this stuff done on-time and on-budget. In NYC, the largest and most powerful city in the U.S., can’t get anything done properly. A massive shame. The City built the 3rd Water Tunnel, so the competence to do this stuff exists. It just wasn’t on this project. It wasn’t “built”. Its a longer money hogging project than any MTA tunneling project. It will be done after 80 years and 4 generations of union construction workers. But it’s on-schedule and on-budget. What will these big contractors and their union employees do when the construction is done? Better to drag on construction by many years and increase costs/payoffs by the billions. It’s the best deal in town. 1. The extra amount of money required for the project, $2 billion, is an acceptable cost for the ridership expected. $8 billion is as good as gone. 2. I specifically treat the amount of extra spending as $2 billion, the cost overrun, rather than $6 billion, which includes the unspent amount, because I am deeply skeptical about the political merits of canceling under-construction projects. ARC was canceled when construction had barely begun. The precedent would affect projects of far stronger merits than ESA, since politicians in the US grandstand and have little understanding of which infrastructure projects are good and which are wastes. 3. My understanding of the state of ESA is that the design flaws are set in schist already. The TBM finished drilling to the deep-level location under Grand Central, and was entombed south of the tunnel. Dropping the cavern at this stage will probably cost more money than it will save; drilling a new tunnel to the existing station, starting from a preexisting tunnel that points in a different direction, is difficult, because you have to mess with the concrete lining. In particular, if ESA is canceled, then the extra capacity across the East River that will eventually be needed isn’t going to cost any less. This is unlike the ARC situation, in which if Christie had dropped the cavern and gone Alt G he’d have saved large amounts of money. 1. The extra amount is only $2 billion if no further overruns occur, which I am absolutely convinced is not going to be the case. 2. I’m not so sure that the political merits of canceling under-construction projects are what we should be concerned about here when the massive degree to which ESA has overrun is so far only matched by the Big Dig and on track to eclipse even that in its steady progression along a trend-line pointing towards the end of time. Hyperbolic? Yes, but appropriately so. At this point the political ramifications of canceling this project are and will be felt against “all future projects that end up overrunning their schedules and budgets so badly that two months after the initial estimated completion date, the project is further from completion then it was when the funding agreement was signed” and probably not against “all future transit projects.” I think it’s telling that if this was another roadworks project (in fact, if this was any other category of infrastructure project besides mass transit), everyone here would have been right here with me in howling for its suspension and/or cancellation and the howls would have started two overruns ago. 3. This wouldn’t be the first time projects have been left unfinished or redesigned, and the vestigal infrastructure from what was once to be left lost to the annals of history. NYC and other cities are littered with relics of the past’s mistakes, in fact. I’ve backed off on howling for it to be full-stop cancelled immediately only because there’s a third option halfway between ‘canceled’ and ‘ongoing’ here: suspending the project until such time as we figure out whether the repeated overruns are criminal incompetence or criminal malevolence, holding all those responsible accountable for their crimes, and then evaluating the decision to complete or cancel the project based on the results of the investigation into what went wrong here. Whether we’re really being sandbagged or not, whether the root causes of this are corruption or anything else, whether or not the project runs out of time and over budget one more time or ten more times – we at least deserve to know how and why we came to this point. It isn’t fair to anybody that every single time this thing runs over the reaction is “Oh no! This is a disaster! Why did this happen? Well, we must press on. We’ve come too far to go back now.” Time, after time, after time. We can agree to disagree about the merits of continuing. Can we at least agree that we should find out how we got to where we are before we soldier on any deeper into this never-ending abyss? They used to have “grand jury investigations” for things like this, but our country’s legal system has degenerated and now there’s no investigation or oversight of public corruption any more. Suspension would probably give up the rest of the project’s federal funding, because the feds want to see a finished project. Who says it will only cost $2 billion more to complete the project? They’ll spend the $2 billion more and then claim it’s not enough. If they got away with lying to us once, why not try again? I suggest we send the politicians and bureaucrats from Long Island who demanded this bizarre design on trains to the unfinished deep cavern station, as it is. And leave them there. Here is a good analysis of cost overrun in a transit project in another country. Both the contractors and government authorities are blamed for various misdeeds. If only we could have such a system of investigation here. That sounds like something we could use to evaluate this project – if it could somehow be done with credibility and integrity. There are so many ways that such a process could be used or abused – from whitewash to witchhunt, from paperover to paper overflow, etc, etc, etc. Political postmortems are not really worth it; it’s like they say about wars, the winners write the history. The hell of it is, is that it is all “other people’s money” in many ways. Whatever isn’t being paid for by Uncle Sam (which is definitely other people’s money), will add to the already unmanageable debt. Now that debt is arguably “ours”, but beyond a certain point it has to get settled some other way. It is probably no coincidence that the history of railroads (and other big projects too) is littered with bad debts and bankruptcies. Can the MTA go bankrupt and stick Wall Street with the tab? Is this the new age version of a railroad financing scam? The “debt” can just be monetized, which is the correct thing to do anyway since the money supply is too small.